The elusive +4 oxidation state of the transuranic element berkelium has been stabilised under mild conditions for the first time. Little has been known about berkelium’s chemistry. The element with atomic number 97 is highly radioactive and its most common isotope has a half-life of only 330 days. Most of the few known berkelium compounds are trivalent (+3 oxidation state). The few +4 compounds are unstable and require strong oxidisers like lead dioxide to make. 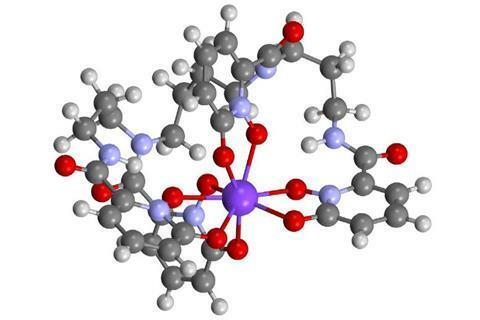 Now a team of US researchers from Lawrence Berkeley National Laboratory and the Fred Hutchinson Cancer Research Center stabilised berkelium’s +4 oxidation state under mild conditions in water using a siderophore, an organic ion carrier. These small compounds are usually secreted by bacteria and fungi and help them form soluble iron complexes. Usually, siderophores – even those carrying other actinide ions such as americium – are recognised by human proteins as part of an immune system response. The siderophore-berkelium complex, however, does not bind to the siderocalin protein. The Berkeley team thinks that this mechanism could be exploited to separate berkelium from other heavy elements, a process that currently involves several arduous separation steps.